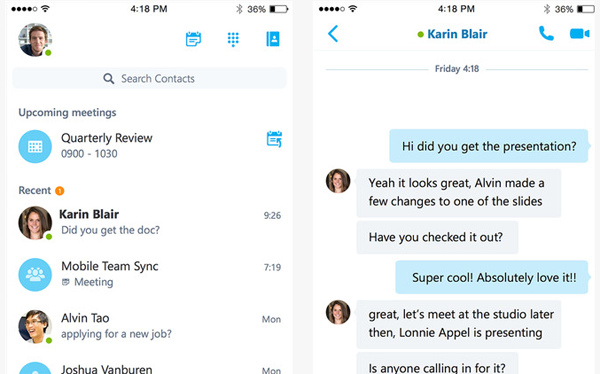 The official launch of Microsoft’s Skype for business app for iOS users is finally here after its release into preview earlier in the summer. Microsoft representatives intimated that the release date android version of the app is set for later in the calendar year without giving any specifics. The new app is now available for direct download from Apple’s App store and on iTunes store. iPhone users with an installed Lync 2013 in their system get an automatic update to the new Skype for Business app. iPad users however, need to download the app to their devices. In an effort to smooth the transition from the Lync 2013 to the new app, Microsoft has availed a guide for IT admins, which covers all the bases that pertain to system configuration and use of the app. One of the outstanding features of the Skype for Business for i OS is the updated dashboard into which various functions converge for a better experience. Among these is the contact search bar which allows users to search their address list using filters search as first name, last name, phone number and email alias. Joining a meeting has never been easier. With the upcoming appointments tab, users can view the details of upcoming meetings and join in with a simple tap. The dashboard also features recent conversations, which affords users an opportunity to view exactly that, regardless of the device on which the conversation actually took place. Full-screen video chatting with screen sharing and simultaneous viewing options alongside larger buttons to add in participants and mute, among other functionalities adds to the meeting experience. Businesses of different types and scales of operation are sure to find these tools and other resources that the Skype for business for iOS a real asset in everyday operation. With this new app in the public domain, business owners and managers in their numbers can now look forward to working away from their desk and collaborating with others without worrying about sub-optimal performance. Previous ArticleEat Me!- Fun Game with Fishes! !